In June 1875, fifty years after the Marquis de Lafayette participated in the laying of the cornerstone of the Bunker Hill Monument—an event largely organized by Massachusetts’s Freemasons—another participant donated a relic of that event to the Massachusetts Grand Lodge. At the close of the ceremony, and after the delivery of the magnificent oration by Daniel Webster, the Masonic portion of the assembly unclothed, preparatory to proceeding to what was more properly known as Bunker Hill, where a sumptuous dinner was partaken of by several thousand persons. As my position, as one of the marshals of the day, gave me the opportunity of being near the person of General Lafayette, I received from him, in that graceful, bland, and affable manner so peculiar to himself, the Masonic apron he had worn during the ceremonies of the day, and which I have faithfully preserved as a valuable memento of that great man, and the interesting and important event it serves to call to remembrance. Whiston gave the apron to the lodge, which still holds it. Ironically, Whiston’s grandfather Obadiah Whiston, a Boston blacksmith, had left Massachusetts with the British military in March 1776 under suspicion of leaking some of the Patriots’ most sensitive secrets to the Crown. I’m not sure he ever actually did, and his widow and children were back in Massachusetts soon after the war (if they ever left). But Francis C. probably didn’t say much about that part of his family history, if he even knew. 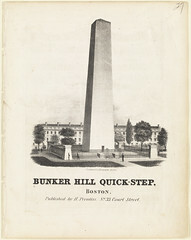 The image above, sheet music for “The Bunker Hill Quick-Step,” appears in the Boston Public Library’s Flickr collection of Bunker Hill Monument images. The Whistons certainly aren't the first Massachusetts family to have a questionable past when it come to who fought- or didn't- in the revolution. Families still experience this today when they dig deep into their family's history. When I received an inquiry last year about a colonial ancestor from Massachusetts, I had to tell a would-be member of a patriotic organization from Texas that the person whom she claimed ancestry from was not a Patriot, but an avowed Loyalist. "Well", I told her, "take heart in this: in rebellious Massachusetts back then, it took a lot of guts to be a Loyalist." My own family reportedly includes some temporarily Canadian folks, as well as some others who valued membership in the D.A.R. I haven’t looked into either set myself, but I’m sure many families are the same. The case of Obadiah Whiston is particularly mixed because up until the end of 1774 there was no doubt he was a fervent Patriot. 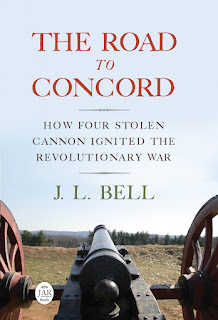 But then Dr. Warren learned that Whiston might give up the location of the cannon now known as the “Hancock” and its companions, and the blacksmith was cut out of the Patriot network.